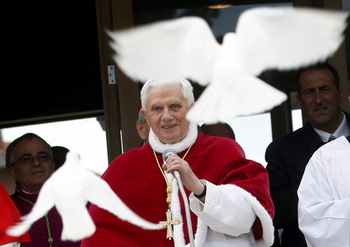 Pope Benedict released a flock of doves — a symbol of peace — as he consecrated the Roman parish of St. Corbinian this weekend. Likewise, he revealed that his prayers have been focused on a resolution to the escalating war in Libya. American and British forces launched airstrikes against Libya this weekend. The coalition mission, which has Canadian support, is enforcing a UN-mandated no-fly zone. The UN Security Council approved the use of force to prevent further government attacks on protesters and rebel forces. Before praying the Angelus on Sunday, the Holy Father said that the news from Libya has "stirred fear and trepidation" in him, adding that he’s following developments “with great apprehension”. He issued a “pressing call” to political and military leaders to protect citizens and guarantee access to humanitarian aid. The Pope also disclosed that he prayed for Libya “especially” during his Lenten retreat. The week-long retreat for the Roman curia, preached by Fr. François-Marie Léthel, a Discalced Carmelite, concluded on Saturday. The pontiff's comments illustrate that, even when he takes a personal retreat, the weight of world events impels him to intercession. As we participate in our own Lenten discipline of interior renewal, we can imitate the Pope's example by being mindful of those who suffer. This week, let us join his plea to the Father: "I ask God that peace and concord dawn for Libya and the whole region of North Africa as soon as possible."